Located on the ground floor of The Pulse, home to establishments such as The Ocean, Tri, and Limewood, Amalfitana is a casual seaside pizzeria inspired by the sunny Amalfi coast of Italy. The open setting, high stools and bar table set against the open-kitchen allows guests to watch pizzas being prepared. 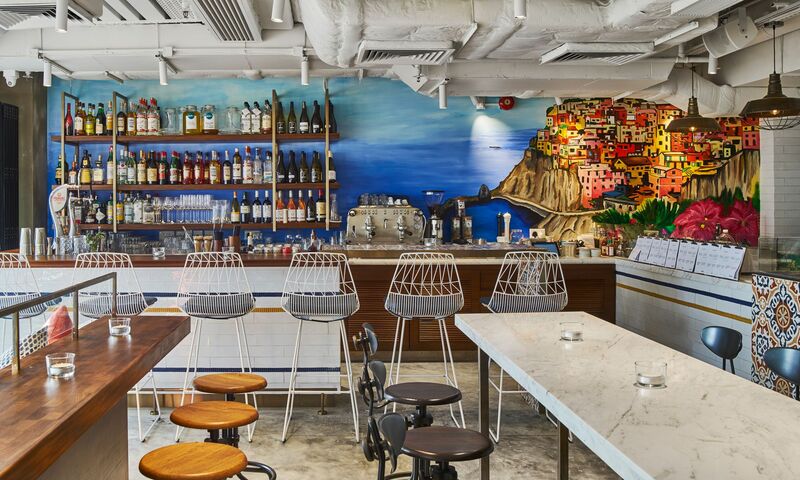 On one side of the restaurant is a colourful mural of Italy’s Amalfi coast, extending through the adjacent bar area. We suggest seating next to the bar as the open screens leading to the beach side tend to invite quite a bit of sun and warmer temperatures throughout summer. The menu at Amalfitana is simple, with offerings divided into sections of antipasti, pizzas, specials and desserts. Guests are encouraged to start with a cocktail, then move to salads to start., such as the fennel orange, a classic vegetable and fruit combination. The mango vinaigrette is an unseemly choice and rather muted from the refreshing crunch of fennel strips and tangy blood orange supremes. Eggplant Parmigiana arrived at the table bubbling, the thin slices of aubergine stacked alternately with cheese and tomato sauce. It is also the only hot antipasti if you don’t count the garlic bread and focaccia. We love how creamy and melting the aubergine turned out, and the tomato sauce tasted just right, with a touch of tartness to it. Primavera is our pizza of choice, served on a large plate elevated by a wire stand. Served whole at the table, cutting may be difficult with limited table space. The pizza, crisp and perfectly charred on the edges and thin throughout, though we’d prefer the middle a little firmer; instead, we got a soft, slightly floppy base that couldn’t hold the toppings in place. The filling of pink, ribbon-like prosciutto is generously scattered across the pizza, atop fresh crunch of rocket leaves and warm, molten mozzarella cheese that adhered with the sweet tomato concasse. We encourage sharing the pizza between two guests, so there’s room to sample other dishes such as the calzone and other salads. The dessert selection is modest. We opted for the homemade tiramisu, a classic but served in a mason jar with alternating layers of mascarpone cream and espresso-soaked ladyfingers. The mascarpone layer, surprisingly light and mildly sweet, makes a great ending to a full Italian pizza feast. It’s all about cocktails at Amalfitana, as the mixologists’ creations headline on the front page of the menu before food offerings. There is a section dedicated to negronis and its variations. The Primo Bacio is refreshing and sweet, as orange bitters offer depth to minty ginger beer and Suze, a liqueur that complements the zing of ginger. The Al Fresco is fresh gin-based cocktail with Aperol. Grapefruit cordial and elderflower made it easy to drink and an excellent aperitif. Service at the restaurant is warm and welcoming. Some of the staff need better knowledge on menu offerings, especially to familiarise themselves with the signatures. The bar staff are knowledgable and patient in pairing cocktails with food orders. Some dishes require extended waiting time. Our full dinner for two at Amalfitana amounted to HK$780. The abundant choices of pizzas and composed salads ensures there is something for every guest, and cocktails are always a reliable beverage of choice at this seaside pizzeria.